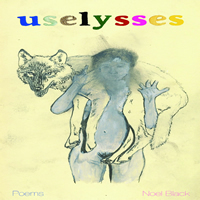 “Uselysses,” which contains five discrete books of poems written over the last four years, is Black’s first full-length book of poetry. Some are poems of experience, others are night raids or open attacks on the reserves of meaning that derive from properly appreciated experience; meanings that are backed on faith so that one can keep having meaningful experiences in the future. As a radical questioner of such faiths, Black subjects his own skepticism to sufficient pressure to line a mine with prodigal kindness or absolute contempt, depending on the company. His poems have appeared widely, but few of the poems in this book have been published anywhere until now. ISBN-13: 978-1933254890. Published by Ugly Duckling Presse, 2011.